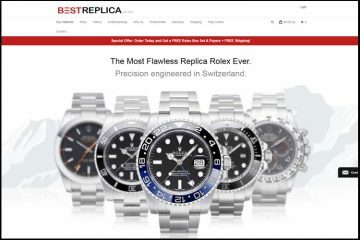 Calling your replica website RealDesignerWatches.com is a clear exaggeration and also highly unsuitable, but all is fair in love, war and…advertising. This company knows that watch passionate people are dedicated to finding the replica timepiece that is undistinguishable from the real one, and it wants to point out that it may very well be the place where this becomes possible. So let’s find out if in this ambitious quest, the merchant will prevail or simply fail. Realdesignerwatches.com is a really colorful and also quite full website. It is like an abundance of multi-colored banners. Still, considering all this, it is not too tacky or too bothering. 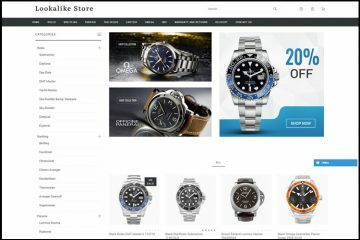 It looks ok. To start exploring the website you only need to use one of the two main menus: the simpler top side menu is for the informative pages, and the long left side menu bar is for the watch brands. On the right part of the Home Page you can see the main promotions and advantages the company’s has to offer to its customers, like the chat button, the best sellers, the free shipping offer and its contact phone number. The left side menu bar reveals an impressive collection of watch brands. The company sells all important luxury names and manages to offer a variety of designs. All these designs represent the most appreciated and popular models ever made by the original companies. Any watch collector would be lucky to include them in its collection. Furthermore, the products are very well organized and divided into representative categories corresponding to their original collection name, to their functionality or to the main material used to manufacture them. The watches cost about $100 to $250. The prices are quite affordable and depend on the design and on the materials used on the items. The replicas are Japanese made. The more expensive Swiss version isn’t available with this company. The overall amateur look of the website is present also on the product description page. But even though it may look totally sloppy and bulky, its content is far better than on most replica websites. The information written about these watches is particularly comprehensive, inclusive and highly professional. With rich details you are guided through the specifics of each replica it sells. Orders are being shipped with FedEx, UPS, DHL and EMS Speedpost. If your item gets lost in transit, the company can arrange to ship out a replacement item at no extra cost to you. The delivery time is about 7-14 business days depending on your location. The shipping fee is a flat rate of $27.95 USD. This means that the cost will be the same no matter how many items you order as long as they are shipped in the same package. Do not forget that orders over $299 benefit from free worldwide delivery. All products are covered by a manufacturer’s defect warranty, but it doesn’t say for how many days or months this warranty is available. In case the items are defective and returned within 5 days from the delivery, the merchant will issue a refund or exchange them with another product. This is quite a short time frame. The return request needs to be approved by the customer service department first. The shipping fees and other charges will not be refunded. Only the cost of the watches is refundable. Plus, if the watch is not defective, a 20% restocking fee will be deducted from the refund amount. Everything about this warranty sounds pretty costly, if you ask me. 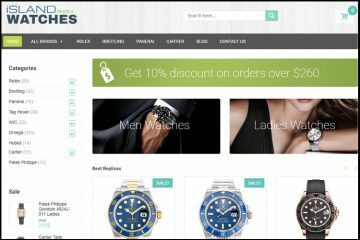 Realdesignerwatches.com is able to process only Visa card payments. This is from the start a big minus for the company’s liability. Solid and reputable merchants need to be able to accept at least three worldwide used payment methods. A customer needs to have alternatives to card payments. Not being able to offer other options to your clientele, shows that you are not a reputable website and that you don’t invest the necessary time and effort into acquiring alternative payment forms. Pictures: The product photos are a joke. Each replica watch features only two pictures. One generic front photo and one poor quality side photo. Both of these images are quite small and of a very low quality. I am quite tolerant when I say that these pictures are useless for any person that is actually interested in assessing the degree of quality of these watches. As a company, you can’t believe that if you use these photos, your customers will look at them and be convinced that you are selling excellent merchandise, the best quality there is on the market within this price range. 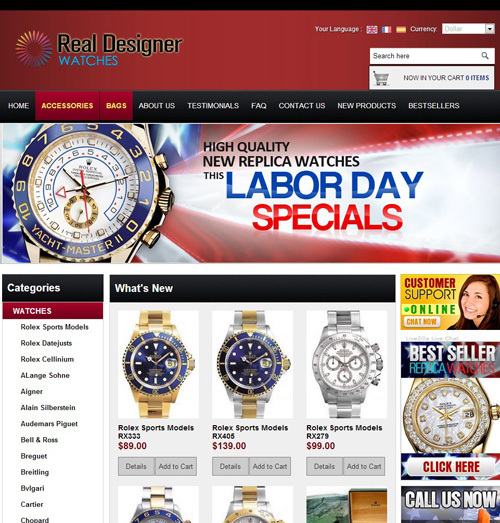 Customer service: Realdesignerwatches.com provides customer service by contact form, phone number and live chat. Surprisingly, the company doesn’t offer an email address to its customers. You are supposed to send a message through the contact form from the website and wait for them to reply by email. I don’t quite understand the reason for not putting their email address out there, but at least I can admit that they offer the best contact forms available: phone and live chat. Only a few companies have the necessary staff and resources for providing support through these communication channels. Summary: Realdesignerwatches.com seems to be a reliable source of high grade Japanese made imitation watches. 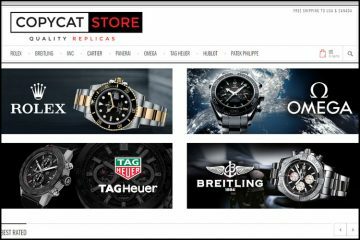 The company provides everything you are looking to get from a replica merchant: decent quality, good prices, responsive and serious customer service, customer orientated policies and, even, free delivery for large orders. The downside is that it doesn’t provide representative product photos, alternative payment methods and more transparent warranty and return policies.